David Beckham Spotted Wearing His Ray Ban Wayfarers in L.A.
Leaving a cycling class in Los Angeles, Beckham was spotted wearing these classic Ray Ban Wayfarer sunglasses on his way to the car. The Wayfarer sunglasses have been worn by celebs for 60+ years now and this is one of the most iconic styles of sunglasses on the market. Beckham has also been known to wear Ray Ban’s aviator sunglasses. David Beckham is the proud new papa to his first daughter, Harper Seven Beckham with wife Victoria. Already a father to his three boys with Victoria, and one of the world’s most recognizable football (soccer) player, Beckham sure is living the posh life. Always stylish on and off the field, Beckham is seen hear wearing the Ray Ban RB 3138 Shooter Sunglasses. David Caruso, is best known for his role in the CBS hit show CSI Miami as Lieutenant Horatio Caine. Caruso’s character H as he is affectionately called, has become synonymous with his witty one liners and his signature Silhouette sunglasses. Here Caruso can be seen in character in his Silhouette TMA 8568 Sunglasses. YEEEEEAAAHHHHHHHHHH! Disney darling, Demi Lovato is certainly looking forward to a fresh and relaxing new year after a hectic 2010. Seen here wearing her stylish Versace 4165 sunglasses. 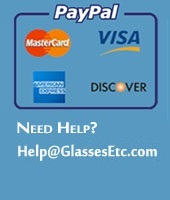 Get yours online today at GlassesEtc. Drew Barrymore was spotted making her way through LA wearing these awesome Ray Ban Aviators in Black that suited her laid-back hipster style. Ray Ban Aviators look great with Drew Barrymore’s beehive look as well! The quintessential aviators for a great everyday look, these sunglasses are practically impossible to pass up! Demi Moore was seen in these classic Tom Ford Raquel sunglasses. These highly sophisticated sunglasses create a fabulous look for Demi and their oversize shape and elegant temple size give Demi an instant Hollywood look!